Mike Fisher knew what he wanted in his next boat: “A classic, something that was not over-designed, nor too show-offy. We wanted slightly more of a gentleman’s yacht, rather than flash. And we wanted more space and the ability to go further.” There were a few other boxes to tick: steel hull; around 35 metres; already in build; comfortable and quiet. He tasked his captain, Benjamin Landuyt, with the job of finding it. Two years later and Fisher was still waiting. Landuyt, meanwhile, had almost given up hope when “I sort-of just stumbled upon this yacht”, he admits. The boat he’d spotted was a 36-metre Martinique model from Moonen Yachts. The 36.3m hull had been started on spec by the yard, and had recently come out of a period of stasis, much like Moonen itself. The Dutch builder, known for its elegant, high-quality steel superyachts, endured a period of suspension in 2015 when its parent company, AHMSA, Mexico’s largest steel company, ran into difficulties. Moonen had three yachts in build at the time – a 29.9-metre Matica model and two 36.3-metre Martiniques – and work on all three slowed to a standstill. When trading conditions improved for AHMSA in 2016, Moonen was recapitalised and the focus was placed on getting the Matica finished; it was delivered in 2017 as Bijoux. Attention could then turn to the first Martinique hull (the second was in very early steel-cutting stages), which, being a bigger, more demanding project, needed a buyer. Landuyt says: “From what I could see it looked like this was the boat we had been looking for.” A visit to the Moonen facility confirmed it. 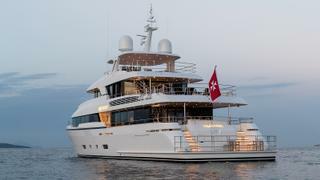 Fisher, it should be pointed out, is the owner and founder of London-based design company Studio Indigo, which was responsible for the interior design of the 70-metre Feadship Joy (a World Superyacht Award winner), so it was key that the Martinique offered him and his team an interior canvas they could work with. Helpfully it had originally been designed with a large family in mind, says Luca Pedol from Nauta, so it wasn’t “over-designed”. The personalising started in the main saloon, says Fleur Liversidge, senior associate at Studio Indigo. 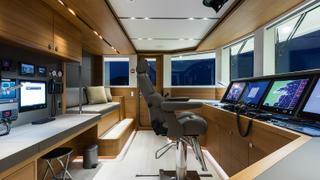 “We wanted the interior to be comfortable and practical. We avoided anything that felt contrived or unnecessarily precious,” she says. This is important because Fisher always travels with his two American cocker spaniels, Lucy and Farah. “The dogs bounce around all over the place and they do sit on the sofas, so it’s got to be a pretty robust interior. But one that wouldn’t date. It’s not trying to be pretentious, it’s just cool and easy,” he says. The sofas in the main saloon are by Holly Hunt and side chairs are off-the-shelf Giorgetti pieces. A Tufenkian rug picks up the tones in the wall panels, chairs and custom coffee table by Decorus and anchors the room. The flow of the main deck is fairly conventional, with a saloon and dining area leading into a master cabin forward and a galley to port, but the way these individual spaces are arranged is a little different. The galley, for instance, is oversized for a boat of this length, and finished as a guest space. “Food is our hobby,” says Fisher. “Cooking is an essential pastime on the boat. Everyone is expected to join in – including the guests and crew.” In the forward master, meanwhile, the bed is facing rearwards, instead of forward as you might expect. It’s something that’s been changed in the layout for the second Martinique hull, which Studio Indigo has laid out and designed in collaboration with Moonen Yachts. 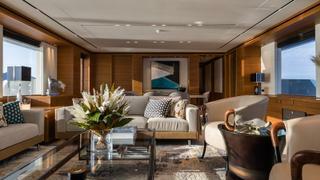 To avoid the teak panelling becoming too monotonous on the four-cabin lower deck, pale horsehair sections have been introduced in the walls – one of the major interior changes Fisher and team were able to make in the three-month window – and art from Fisher’s collection, mostly from a house recently sold in South Africa, animates the bulkheads. 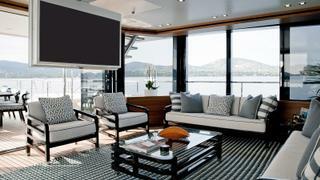 The stand-out feature in any cabin, however, is a woven leather tartan-effect headboard in the master made by American firm Lance Woven Leather, which plays with the Scottish provenance of the yacht’s name. The original budget for the interior, set by Moonen, was £80,000; in the end, Fisher and team spent £465,000. 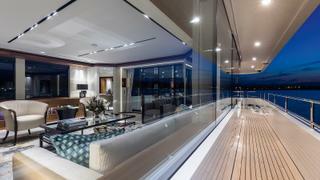 “But what we felt was, a boat of this quality had to have the kind of quality interior you’d find in an €80 million [£70 million] house, so it had to be stepped up. We had to break up the wood and we also had to try and give the cabins a bit more character.” To aid this effort lights by Charles Paris were introduced, as were gunmetal and nickel touches throughout. The aggressive delivery schedule was met and Fisher spent summer 2018 cruising to the eastern Med and back with friends and family. He admits to barely leaving the upper deck saloon. If the main deck is conventional, the upper deck is the opposite; it’s a true inside/outside space, with deck teak flowing straight into the saloon and enormous windows creating a winter garden with eternal views. “I wanted a winter garden on Joy and here I am getting one of my own. The windows slide back and you end up living up here,” Fisher says. The furniture reflects this hybrid vibe, with loose Summit pieces designed by David Linley and a tactile, external carpet from Tim Page emphasising the informality. This sense of ease is best exemplified on the sundeck, where the bar is open to guests instead of acting as a more formal serving station for crew. “We’re much more communal in the way that we live on the boat. It’s not 100 metres long, it’s 36 metres long. You go and help yourself if you want something to drink. It works well,” says Fisher. Drink too much, though, and the closest dayhead is on the main deck, a layout issue that, again, Studio Indigo has addressed on hull No 2. 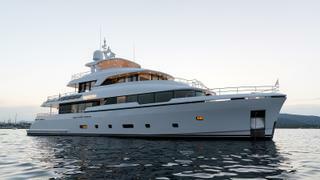 As for Captain Landuyt, he’s happy that the boss is happy – but he’s equally pleased with how the yacht performs. Brigadoon’s hull was built in grade AH36 high-tensile steel, which is an unusual choice, as it’s more expensive that standard Grade A steel commonly chosen for yacht building. 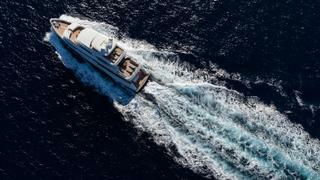 But it’s stronger, so you need less of it – which means, when combined with Brigadoon’s fast displacement hull form and long waterline length (the bathing platform, for instance, is a continuous part of the hull and not overhanging), this boat is a relative speed demon, topping out at 16.5 knots on sea trials. Brigadoon is the perfect example of that. 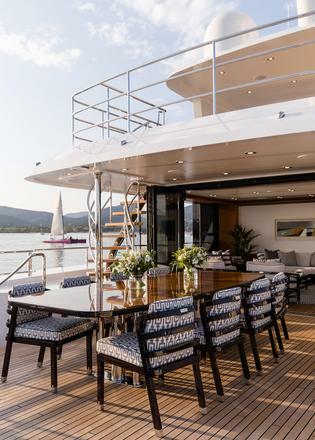 She is a superbly well put together yacht, finished with the kind of exacting detail you’d expect of this yard and the pedigree of designers involved. The problem is that no one ever wants to leave. “We brought my mum and dad on in the summer. They were only supposed to stay for two weeks; they ended up staying for four,” sighs Fisher. But if that’s your biggest snagging issue with a new-build superyacht, you know you’ve bought a good one. First published in the January 2019 edition of Boat International.